Zillow's completed acquisition of Trulia provided most of the gains, but its continued work with real estate professionals and listing services may be of more importance for long-term investors. So What: After being announced in July, the Trulia purchase was initially considered to be a rather easy merger, with Zillow CEO Spencer Rascoff stating he did not expect the merger to face opposition from antitrust regulators. In December, however, Zillow announced the merger date was put on hold until mid-February, pushed back from Feb. 1, to allow time for an FTC inquiry. News leaked out the FTC closed its inquiry earlier than the official announcement from Zillow, making the company stock jump in anticipation of the deal. 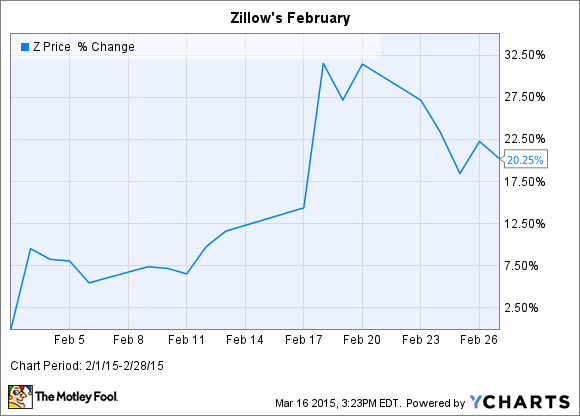 Ironically, long-term Zillow investors were aided by a long closing period due to the initial terms of the merger deal. Initially set at 0.444 shares of Zillow per share of Trulia, and not tied to a fixed dollar amount, the price of the deal gradually fell from $3.5 billion initially to roughly $2.34 million at the closing date as shares of Zillow dropped from $160 per share at announcement to a little over $106. Adding to merger gains, the company in February reported excellent earnings on both a full-year and fourth-quarter basis. Full year, the company increased revenue 65% from 2013's figure while that number came in at 58% for the fourth quarter over the prior year's Q4. Now what: For investors, February was a great month, but perhaps a late January announcement was more important to long-term shareholders. In January, the company signed a deal with the largest multiple listing service, Metropolitan Regional Information Systems, that allows MRIS listings to show up directly on Zillow through its Zillow Partnership Platform. On an operational basis, the MRIS deal was indicative of Zillow's continued push into the real estate market by providing solutions for all actors. Last year, its Partnership Platform more than doubled the amount of participating listing systems, and its Zillow Pro for Brokers and Zillow Data dashboard continue to grow in size and scale while adding value to the service, and its Tech Connect continues to add tech-based solutions for real estate professionals. In the end, Zillow continues to innovate and should eventually become an integral part of the largest purchase most Americans make.